The new season of the hit series Game of Thrones has kicked off. 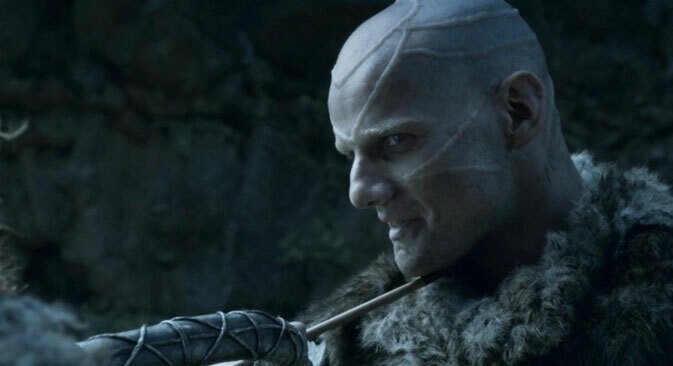 Russian actor Yury Kolokolnikov plays the leader of the Thenn, from the folk of Wildlings. At a press conference in Moscow, he talked about his character and advised budding actors on how to conquer Hollywood. How did your character appear in the series? Yury Kolokolnikov: Writers David [Benioff] and Daniel [B. Weiss] came up with the image and character. One show of the new season was written by George R.R. Martin himself, the author of the book. In the TV show, the characters are slightly different. For example, in the book the Wildings are not cannibals, this was thought up by the scriptwriters. The next step was to create the character’s appearance and makeup. When I arrived, I was shown images created by computer graphic artists and designers. We tried to bring their ideas to life on my face. And after all this, the ideas have to be melded with the actor. We came up with his walking style and other details. For example, the Wildlings should not have ears, so in place of my right ear there should have been a huge scar. But in the end, when we watched the final version, we decided to leave the ear. Who do you think deserves the Iron Throne? Y.K. : It's a game of thrones – everyone is deserving in their own way. From the point of view of morality, of course, the positive characters are Arya and Jon Snow. But even they sometimes have to do morally ambivalent things. But really, the leader of the Thenn should take the throne, who else (he laughs)? Who would your character Styr like to eat? Y.K. : I won’t give it away, or it won’t be fun to watch. But probably a dwarf would taste pretty good. Or Styr might like to try the flesh of the white-skinned princess Khaleesi. And, of course, the children would be the most delicious (he laughs). Will they dub over your lines for the show? Y.K. : No. I lived for a long time in Canada and America, so my English is good, but more with an American accent. In GoT, they all use British, Irish and Northern Irish dialects. I worked with a tutor to get it right. We made my pronunciation more angular. For example, Styr says the word “crow” all the time. We tried to make it sound more ominous, almost like the Russian rolled “r”. What has GoT given you as an actor? Y.K. : It has been a very valuable experience, watching how professionals create a series. This is my first time working in fantasy. It has been very interesting. Getting to feel like a cannibal is pretty cool! From your experience, how should a young actor break into Hollywood? Y.K. : Dividing it up into Hollywood and not Hollywood is a mindset from the Soviet Union era, which, of course, could come back again... But the world has changed - there are no borders and no Hollywood. This is the main thing that I have understood. Therefore, that’s not the question to ask. Young actors need to think about their own creative and professional development. And in general, the most important thing is to study English from childhood.